It is an exciting time of year for public education in New Mexico. Last week at the annual spring budget workshop in Albuquerque there was a strong message of optimism for New Mexico education. Dr. Karen Trujillo, our new secretary of education at the Public Education Department, has staffed her department with New Mexico educators that know our schools, culture, and have relationships across the state. In addition, the New Mexico legislature is adding over $450 million dollars into New Mexico’s education system, providing an opportunity for our schools to fund themselves more substantially than in previous years. We are proud to have a physical health provider at school-based health. We now have a nurse practitioner for Region School-Based Health Clinic. Linda Owen will be working every week on Monday and Wednesdays. Services for students and children are free. There is a $30 visit copay for school staff, Region 9 staff, and adult parents of children. Please call (575) 630.7974. April and May bring Region 9 employee evaluations. Evaluations are a great opportunity to get feedback from your supervisor to help you grow and improve. This is also an excellent time to communicate with your supervisor about ways to optimize your work and to discuss how you can be sure to support their needs for your team. Make sure you are working with your supervisor on your professional development plan for next year. Your new leadership team is in place and recently had their first meeting. We are excited to have new additions to the team and look forward to the direction and leadership they will provide. 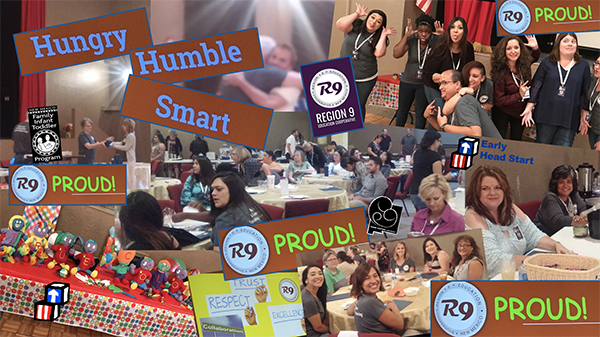 Members of the Region 9 leadership team are as follows: Dahn Freed, Carma Patterson, Judy Jones, Melina Romero, Gina Corliss, Stacy Wren, April Blackwell, Carmen Spann, Ashlee McEwen, Calla Goeller, Billie Arguedas, Carolina Hernandez, Joanie Bingerman, and Teresa Barnett. If you have items that you feel someone at a leadership level should address, please communicate with one of the members, and let them bring it to our attention.